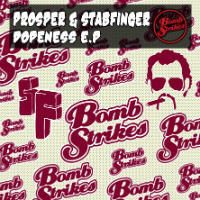 More Bomb Strikes action on the Dopeness EP from Prosper & Stabfinger – the dream team responsible for October’s similarly old school three-tracker, the Mista Funkmaster EP. On this latest drop, the title cut rocks a disco bass-line as NZ emcee Imagine This takes the mic while Pay For Bass makes use of a Lyrics Born rapapella over initially jazzy-influenced breaks that become increasingly electronic after the bridge. It’s the third cut that really rocks the spot however as Stetsasonic, 80s Bronx emcee Antoinette and Marvin Gaye are cut up over an uptempo beat.